The video “Haven” features three world-record holding freedivers exploring wrecks and the deep blue Mediterranean Sea. You’ve gotta see this. The horrific Operation Hailstone turned Truk Lagoon into wreck-diving paradise, with more than 50 wreck sites steeped in history and rich in marine life. Has Global Warming Destroyed the Great Barrier Reef? A UNESCO World Heritage Site, Australia’s Great Barrier Reef is home to more than 1,500 species of fish, and one-third of the world’s corals. It generates an annual income of $3.9 billion per year, and provides employment for nearly 70,000 people. Unfortunately, and as many divers will know, a recent study shows that this incredible natural wonder is in the middle of an unprecedented disaster. According to a series of surveys undertaken by the Australian Research Council Centre of Excellence for Coral Reef Studies (ARC Centre), 93 percent of the reef’s corals have been damaged by large-scale bleaching. Australia and many other Pacific countries are currently in the grip of an unusually long El Niño, a climate phenomenon that causes water temperatures throughout the region to rise significantly; this year’s El Niño is is particularly severe in part due to greenhouse gases and subsequent global warming. Led by Professor Terry Hughes, the team from the ARC Centre led aerial and underwater surveys of 900 of the Great Barrier Reef’s individual reefs, which together form a continuous structure around 1,400 miles long. The results showed just 7 percent of the reef system to be entirely free from coral bleaching, with the worst damage focused on the northernmost section of the GBR. In this region, which stretches from Port Douglas to the northern Torres Strait Islands, 80 percent of the reefs surveyed were classified as severely bleached. Coral bleaching occurs as a result of abnormally high water temperatures, which cause corals to expel the zooxanthellae living within their tissues. As well as giving coral its color, the zooxanthellae provide nutrients for their hosts via photosynthesis — without them, the coral will eventually die. Bleaching can be reversed only if water conditions return to normal and the zooxanthellae are allowed to repopulate the coral within a certain amount of time. Devastatingly, it is already too late for 50 percent of corals in the northern sector of the reef. Experts working with the ARC Centre expect that this mortality rate could increase to more than 90 percent if the causes of the bleaching are not reversed soon. When speaking of the devastation in the northern sector, Hughes says that the damage caused looks as though “ten cyclones have come ashore all at once.” Fortunately, bleaching in the middle and southern sections of the reef is slightly less severe, with only 1 percent of reefs in the southernmost region classified as severely bleached. Although only one quarter of reefs in these areas are untouched by bleaching, scientists hope that it is not too late for the majority of the reefs to recover. The healthier condition of the southern reefs can be attributed to greater cloud cover and rainfall in these regions of the GBR in recent months. The Great Barrier Reef has suffered two other large-scale bleaching events in recent years, once in 1998 and once in 2002, both of which were also during El Niño. However, the current disaster eclipses both of these events, the worst of which saw 54 percent of the GBR affected by bleaching. Climate change is undoubtedly a contributing factor behind the unprecedented damage wreaked by this year’s El Niño, as the effects of the phenomenon are exacerbated by already elevated sea temperatures. Tragically, the extent of the recent devastation is so extreme that scientists are predicting it will take decades — at best — for the reef to recover, if at all. Many of the corals that have already died were long-lived, slow-growing species that take centuries to form. Consequently, the reefs of the future are likely to be dominated by other, faster-growing species, which will affect the balance of marine life throughout the ecosystem. According to Hughes, the northern Great Barrier Reef may never return to what it once was. To our mind, it’s nothing less than tragedy on a global scale. The post Has Global Warming Destroyed the Great Barrier Reef? appeared first on Scuba Diver Life. Posted in NEWS, Rebreathers, Scuba_News, standards, Teach First Aid/CPR, Tec, Tec Diving, Technology, TecRec, TecRec IT Crossover, UW Photography, Wrecks | Comments Off on Has Global Warming Destroyed the Great Barrier Reef? Perhaps because of their sci-fi appearance, cephalopods tend to intrigue many divers. They’re highly intelligent, able to problem-solve, and have innate camouflage abilities that can be hypnotic, not to mention that they can be highly charismatic video or photo subjects. That is if they’re not being altogether elusive. Sightings are rare at most dive locations, and often limited to very specific spots or night dives. We can hunt for an entire dive, turning over rocks and pulling out shells in search of a tentacle, only to be disappointed time and again. One place this won’t happen is the Philippines, especially in the Dumaguete and Puerto Galera areas. While staying at the Atlantis Dive Resort near Dumaguete, we were treated to not only sightings but also to extended interactions with several cephalopod species, including a couple we had never seen before, two of which are deadly. It would have seemed that with each dive and subsequent octopus, squid, or cuttlefish interaction that our excitement would wane, but that never happened. Even the Atlantis dive guides, who get to see these critters nearly every single day, still seemed excited to find them. The untrained eye can struggle to spot these masters of disguise, but since the Atlantis guides do see them so often, they’re pros at picking them out quickly from their blended backgrounds. We saw wunderpus, coconut octopus, blue-ringed octopus, ocellated (mototi) octopus, flamboyant cuttlefish, crinoid cuttlefish and pharaoh cuttlefish most often during the day dives. At night, the bobtail squid would show their cute little faces while algae and coconut octopuses continued to steal the show. Though we didn’t see any while we were there, mimic octopuses are known to hang out in the area, along with hairy octopus, starry night octopus, two-toned pygmy squid, and bigfin reef squid. Although we would have loved to see a nautilus, we didn’t have any luck. However, sightings have been reported near the Atlantis resorts. While there’s lots of unique marine life to be found in the Dumaguete area, if you’re looking for some cephalopod interactions for photo, video, or just for personal interest, we highly recommend heading to the Philippines. Bring some patience and good buoyancy control, and have a big “thank you” ready for the Atlantis Dive Resorts dive guides. The post For the Love of Cephalopods at Atlantis Dive Resorts appeared first on Scuba Diver Life. 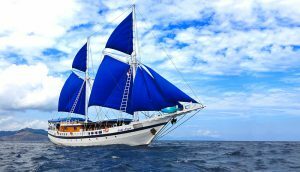 The post Liveaboard Diving Indonesia: The Why’s and How’s appeared first on .